We're closer than ever to fulfilling our destiny as the moon's mole people. According to a recently published report in Geophysical Research Letters, scientists believe they've confirmed the presence of naturally occurring caverns that could "potentially serve as secure shelters for humans and instruments." These are lunar lava tubes, and their existence has long been suspected and hoped for. Now, by combing data from NASA and JAXA (Japan's equivalent space agency), we're more certain than ever that they exist -- and that we've found one. 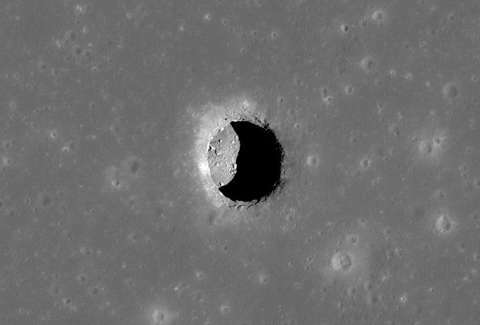 Put simply: A lunar lava tube in the Marius Hills region is the best location for a lunar colony we've found yet. The tubes would be ideal colony sites because, as you probably know, the moon lacks an atmosphere (the lovely space blanket that protects us from asteroids and the sun's rays). Without some kind of shelter, colonists and valuable equipment would be exposed to the unforgiving reality that is life off the planet and outside an atmosphere. The existence of these tubes would mean a ready-made shelter for colonists. The suspected lunar lava tubes are gigantic caverns that formed when lava was carving the surface of the moon. As the top of a lava stream hardened into a crust, the channel it made would sometimes empty out and a hollow tube would remain. Scientists have been speculating about the existence of these potential shelters since the 1960s, but this report is the closest we've come to confirming their existence. The discovery was made by combining data from NASA's GRAIL mission and observations made with JAXA's SELENE spacecraft. JAXA identified possible lava tubes by bouncing radar off the surface of the moon via the SELENE spacecraft and looking for specific echo patterns. This was combined with GRAIL's identification of locations on the moon with mass deficits (less gravity means the spot is likely hollow), and the overlap of these findings means strong evidence that there's a lunar lava tube several kilometers long and at least 1 kilometer high and wide. The view of Earth probably won't be great inside our space cave, but that's a fair trade for not being bludgeoned to death by an asteroid. James Chrisman is a News Writer at Thrillist who believes the moon can talk. Send news tips to news@thrillist.com and follow him on Twitter @james_chrisman2.